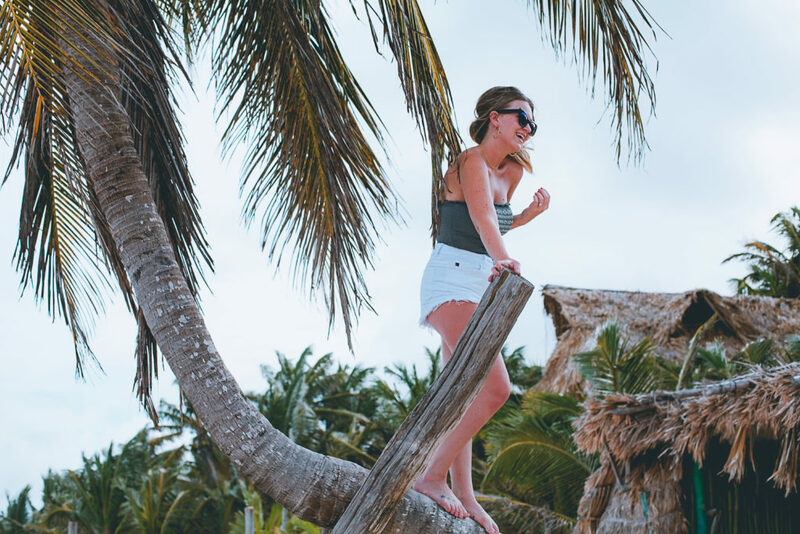 A little over a year ago, my nonstop Instagram scrolling led me to begin discovering the beauty of the most magical Mexican beach town known as Tulum. 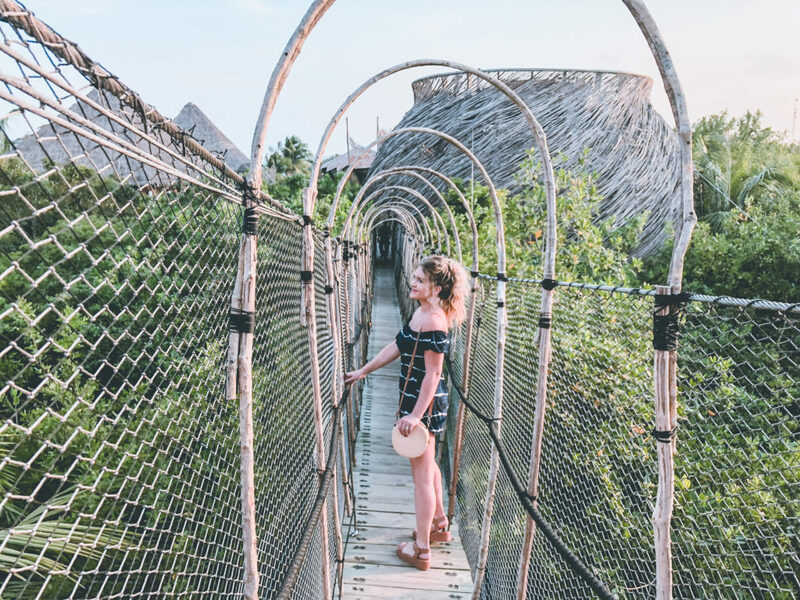 Through other people’s photographs I fell in love with the laid back boho jungle vibes that make up this little eco chic community, so obviously I added it to my bucket list. 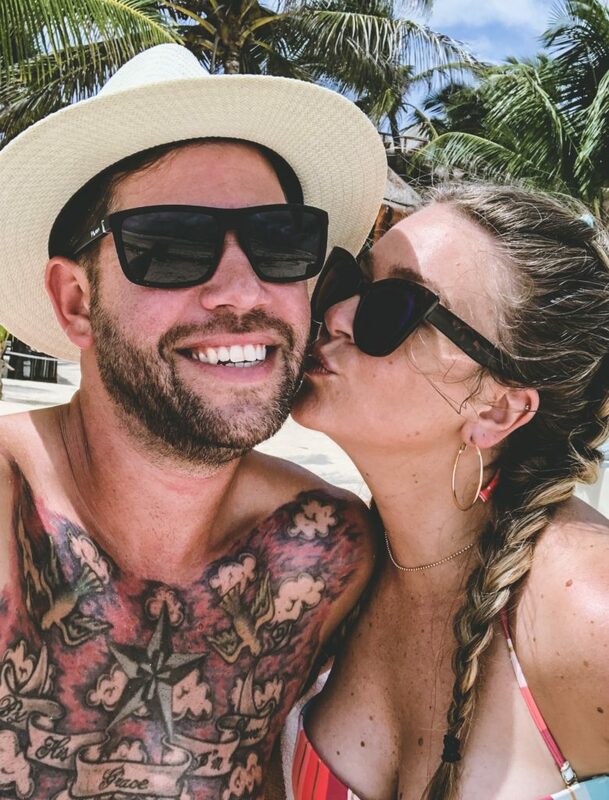 Once my husband and I visited Tulum this past July, we immediately scheduled another trip to go back and celebrate our one year anniversary, which was October 8. As people who are constantly planning our next adventure, it’s very unlike us to repeat a destination. 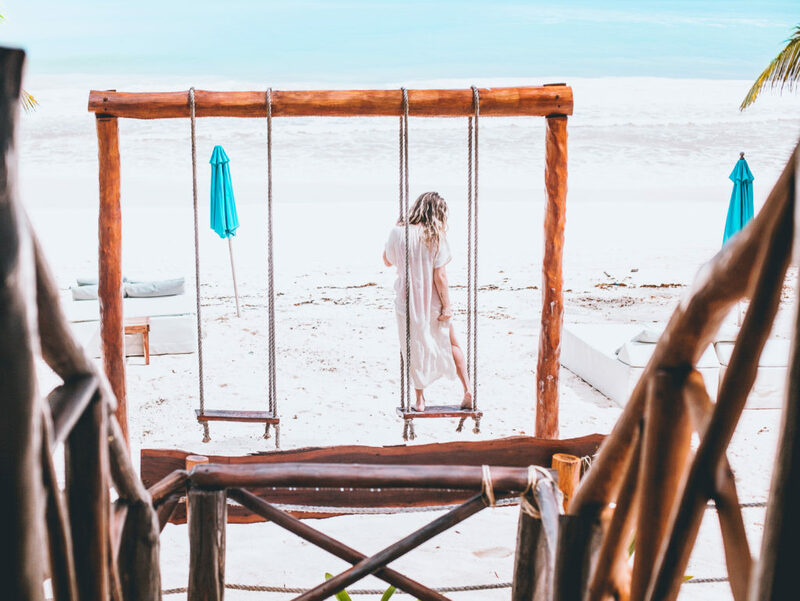 But that’s just how magical Tulum is and I’ll be sharing everything you need to know about our new favorite place. Sometimes I convince him to get on the other side of the camera. What a stud. 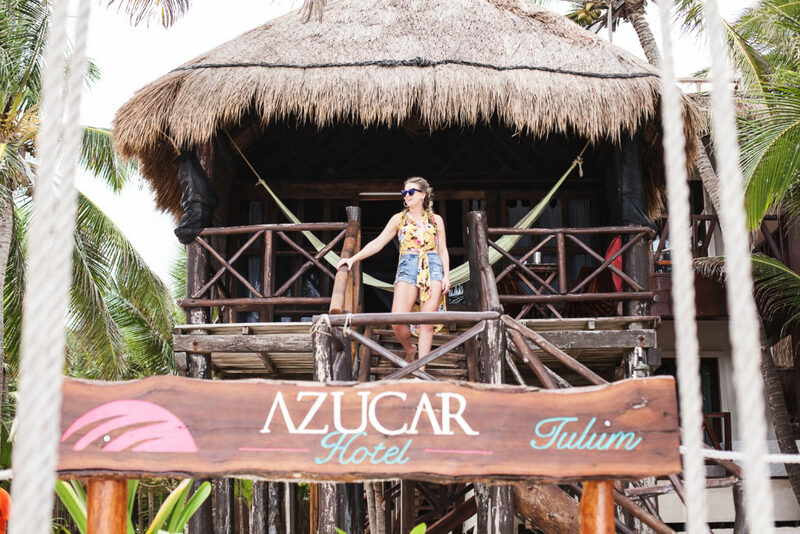 Unlike most tourist destinations in Mexico, Tulum is made up of small, privately owned boutique hotels and restaurants. You won’t see a bunch of high rise buildings with all inclusive deals like you do in places like Cancun or Cabo. You won’t find any chain restaurants, either. The food scene is remarkable, with some of the best dining I have ever experienced. But we’ll get to the food shortly. Fly into Cancun and either rent a car or get a driver. Fly into Cozumel and take a ferry to Playa del Carmen, then get a driver from there. Both times we visited we flew into Cancun (and even got a nonstop on Southwest the first time) and hired the best driver you’ll ever meet. His name is Alberto and his company is First Choice VIP. I highly recommend using them! For around $100 each way, you’ll get a car to yourself, along with a cooler of water and Corona to enjoy on the way. The first time we visited, Alberto took us to an unbelievable fish taco joint on the way to Tulum. We were the only white people there and that’s how you know the tacos are legit. The drive is about an hour and forty five minutes from the Cancun airport to Tulum, but it goes by fast when you’re drinking a beer and chatting with your new friend Alberto. 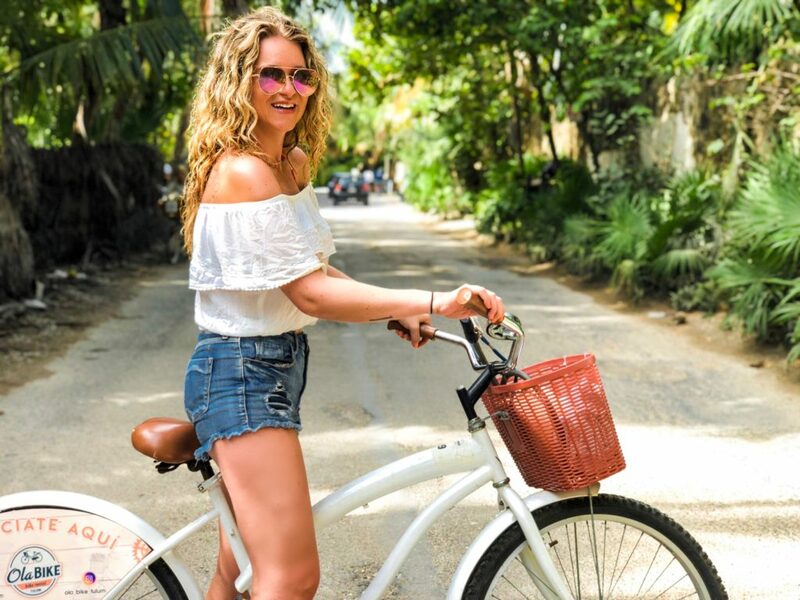 Once you’re in Tulum, you don’t need a car to get around. We rented bicycles the first time, due to the location of where we stayed. This past trip we mostly walked or took the occasional taxi. The bikes we rented were only about $6/day! Totally worth it. We stayed in different areas the two times we visited, which means I can give you an accurate description of the two main options you have. 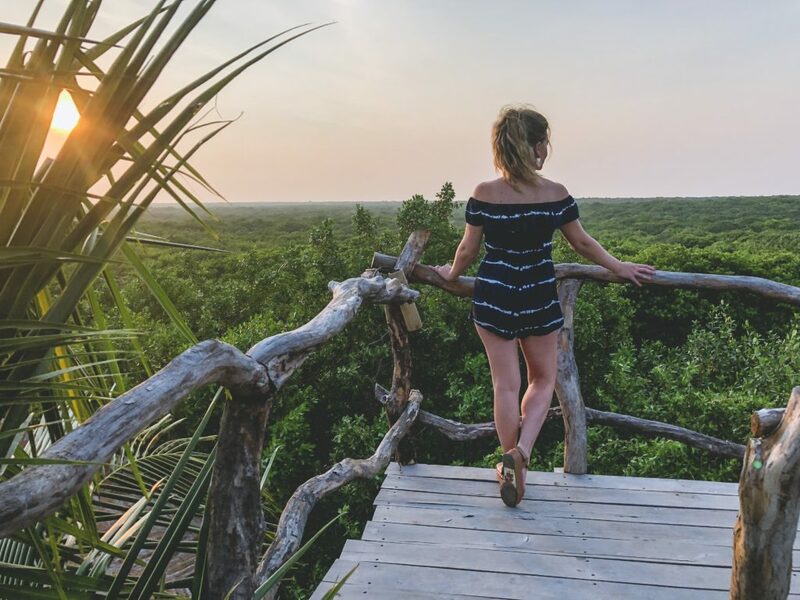 If you’re going to Tulum with 4 or more people and you want a really nice place but you’re on a budget, you can get an amazing Airbnb in the Aldea Zama area for dirt cheap. This is a little more of the “residential” area of Tulum, with nice condo buildings that have pools and some even have rooftops with private hot tubs. This is what we did the first time because we went with another couple. We stayed in a 2 bed, 2 bath condo for $107/night (literally less than $60 per couple per night) and it was incredible! You can check it out here. The only negative to staying in this area is that you are about a 5 minute drive or 10 minute bike ride to the beach. That is the sacrifice you have to make for a really nice, affordable Airbnb! Like I said before, we rented bikes the first time and there is a great sidewalk for bike riding that takes you to the main beach road area. It was also a short bike ride into the downtown Tulum area, where you’ll find shopping and incredible tacos for like 80 cents each. I don’t recommend staying downtown but it’s worth a visit! I got a really cool handmade leather purse at one of the shops there for like $40 and I get compliments on it all the time. The second time we visited, it was just Jordan and I and we knew we wanted to stay right on the beach. 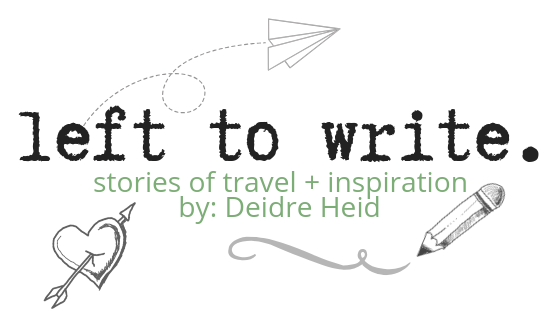 There are so many amazing boutique hotels that it took us a lot of research before we decided on a place. 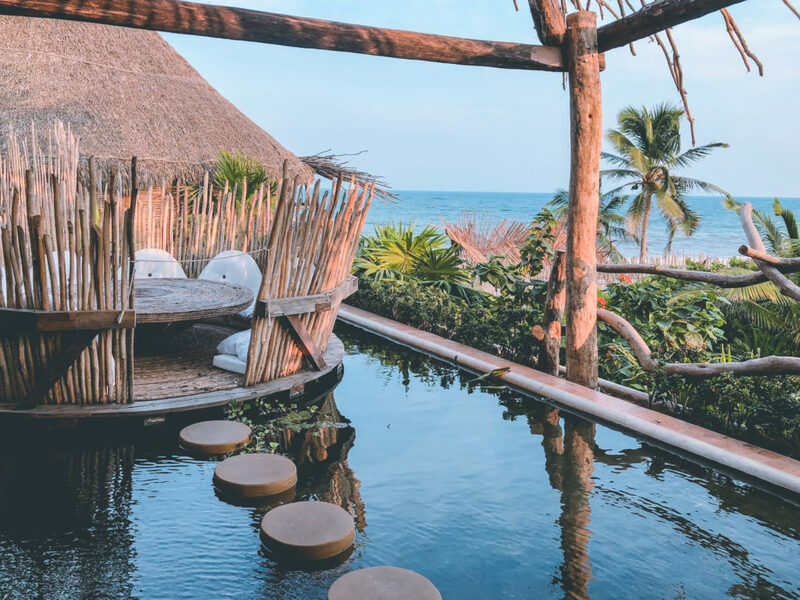 You can stay somewhere amazing like Be Tulum and have your own dipping pool and ocean view, but it is super expensive. Or you can check out CoCo Tulum for somewhere much more affordable, but still with A/C and WiFi. Plus, they have an awesome beach bar on site. The white swings at the CoCo beach bar are always a great spot for a cute pic! There are also plenty of suuuper rustic places that don’t even have electricity, but are super cheap. We decided on Azucar Hotel because one of the rooms they offered was this bungalow that sits right in the sand, literally 10-15 steps to the ocean. We loved our little beach bungalow! Since we were there during the off season (Sep-Oct is the least busy time to go!) we scored this place for $120/night. It had electricity and WiFi, but no A/C. The fans and the ocean breeze kept us cool, though! It wasn’t an issue at all. We also loved that this bungalow had a little kitchenette area, including a mini fridge. We had Alberto take us to the grocery store on our way into Tulum and we stocked up on snacks and tequila before arriving! Azucar doesn’t have a bar or restaurant on site, but we brought our Yeti cups and made some yummy tequila drinks in our room, then walked right down to the beach! It was perfect. This is the view from the front porch of the bungalow we rented. You can’t get any closer to the beach than this! Azucar is also the BEST location we could have asked for. Almost all of the amazing restaurants, plus our favorite bar (we’ll get to those next) were all less than a 2 minute walk. We were so so happy with our choice! The only thing many other hotels offer that we didn’t get was an actual breakfast each morning. But they did provide coffee and fruit, plus we were located right across the street from a cute little coffee shop that had delicious cappuccinos and little breakfast sandwiches. 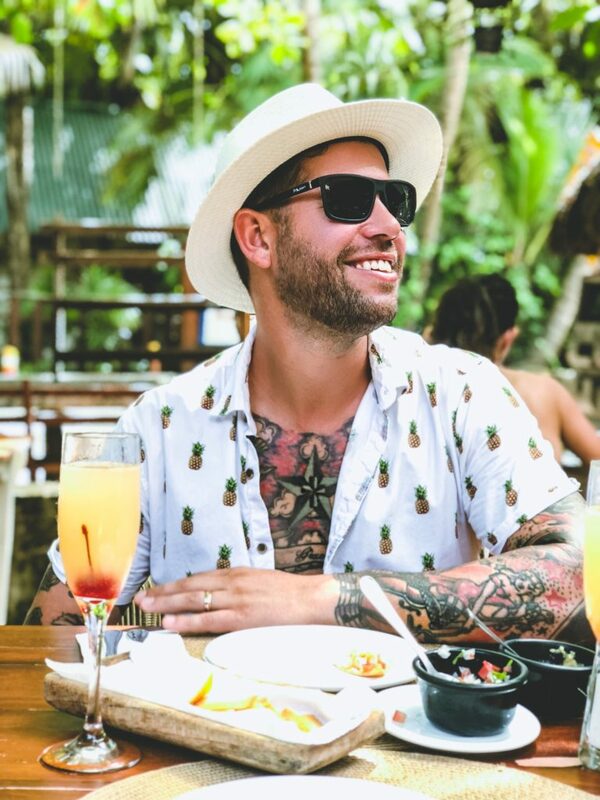 Tulum is definitely known for its’ restaurant scene, and I can confirm that it’s worth the trip down there even if all you did was eat!! If you consider yourself a foodie to any degree, you need to plan a trip here. There’s no question about it. The food isn’t cheap, though so you’ll definitely be spending $100-$120 at dinner for two people if you each get a couple drinks as well. But it’s SO WORTH IT. Below, you’ll find a list of where we’ve eaten and if any specific dishes really really stood out to us, I’ll mention that as well! -Posada Margherita. It seems weird to get Italian food at the beach, but the pasta here is out of this world! Plus, they have seating directly on the beach which is a plus! -Gitano. This restaurant has another location in NYC and the menu consists of veryyyy delicious Mexican food. It’s tucked away on the jungle side of the street and the vibe is amazing, complete with string lights and a disco ball. I highly recommend the tuna tostada appetizer! 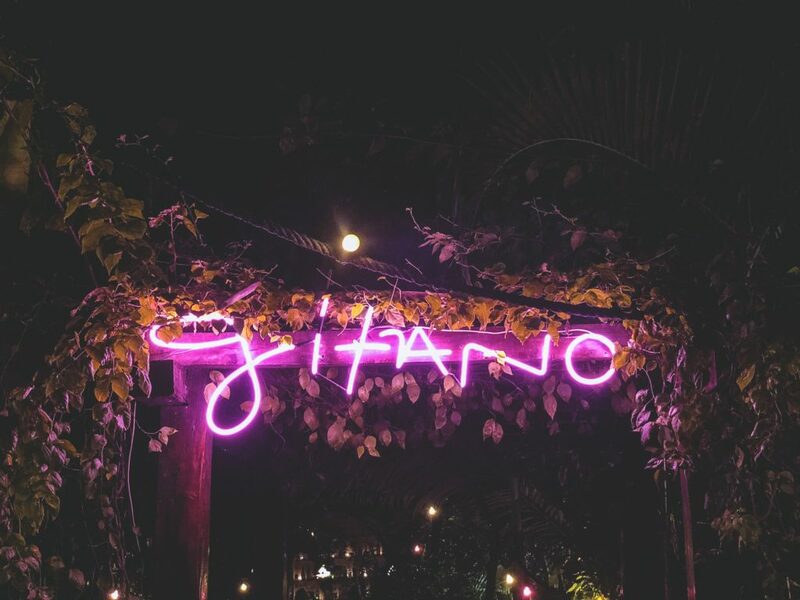 If it wasn’t for this neon sign, you would never be able to find this place! -Kin Toh. Located inside the Azulik property, this is one of the most unique dining experiences you’ll ever have. 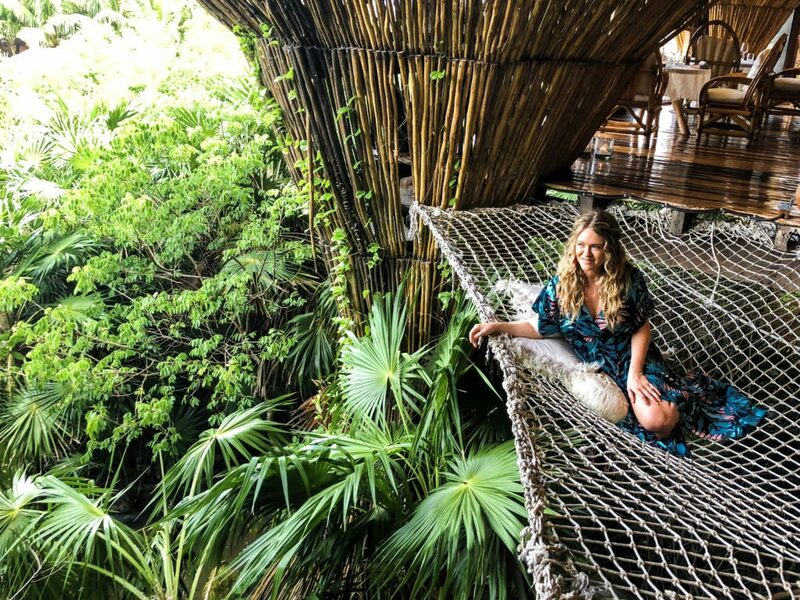 It’s a treehouse restaurant with extraordinary jungle views and hammock type nets you can lay in above the trees. The food was good (the baked oysters were our favorite) but it’s one of those expensive places with small portions. You might not be completely full when you leave, but you definitely want to go here for the ambiance! I recommend getting a reservation before sunset so you have good lighting for photos! This is the best spot to take a photo at Kin Toh! -Tseen Ja. Also located inside of the Azulik property, this Japanese/Mexican fusion restaurant requires you to walk through Kin Toh and over a suspension bridge to get there. The views are one of a kind, the service was impeccable and the food was unique and delicious! We got SUPER lucky and happened to have a reservation here on the night they were introducing their new chef. We sat at a chef’s table with six other people for the second part of our dinner and watched him slice up a fresh, 80 pound bluefin tuna. We then experienced five courses of tuna dishes he prepared right in front of us. It was hands down the best dinner experience I’ve ever had. That probably won’t happen again, but I still recommend Tseen Ja for the food, drinks, and views! Just like Kin Toh, get here right before sunset! You’ll want to experience this place in the daylight, plus the sunset view over the jungle is absolutely stunning. This is the bridge you take from Kin Toh to get over to Tseen Ja. One of the really awesome dining “nests” at Tseen Ja. -I Scream Bar. This is basically the local neighborhood watering hole of Tulum. It’s kind of a dive bar but with delicious food, incredible margaritas and live music on the weekends. It’s great for lunch, happy hour, dinner or late night. We would always hang here after dinner for cheaper drinks and a more casual atmosphere. The shrimp tacos are to die for and the ceviche is great too!! If you wanted to do a cheaper and more casual dinner one night, this is a great option. My mouth is watering thinking about how good the margs are at I Scream Bar! -Taqueria Honorio. This is an authentic and incredibly delicious place in the downtown area of Tulum for breakfast tacos. They’re only open early in the day and it gets packed, but if there’s a wait I promise it’s worth it! Our driver Alberto recommended this place and it did not disappoint! It’s nothing fancy. You don’t go here for the ambiance, but to experience tacos the way they were intended to be. -Taqueria El ÑERO. Also located in downtown, this is the place with incredible street tacos for 80 cents each. The El Pastor are actually 2-for-1 so that makes them 40 cents each. UNREAL. This is just as authentic as Taqueria Honorio but they are open for dinner. I think Jordan ate nine tacos when we came here and I ate six. I’m not even kidding! They are small and it’s hard to stop ordering more when they are so dang cheap. This is definitely a hole in the wall, so don’t expect a trendy atmosphere. But it’s totally worth a visit! -Casa Banana. We enjoyed an incredibly fresh, flavorful breakfast one morning at Casa Banana. Jordan found his favorite huevos rancheros here and I had an amazing avocado toast. The outdoor prep kitchen allows you to watch the cooks whip up homemade salsa and prep food for the day, complete with baskets of fresh fruits and vegetables they use as needed. We had an incredible experience here and I definitely recommend it for breakfast! My cute hubby loving life at Casa Banana. 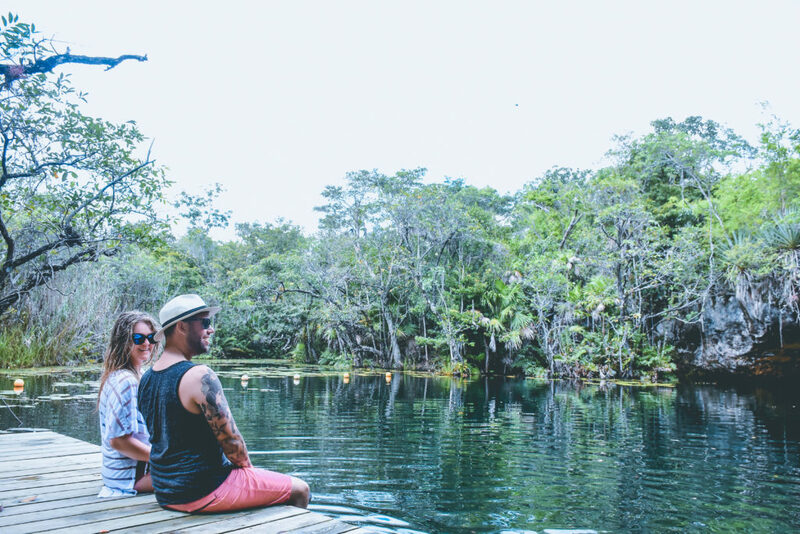 If you don’t know what a cenote is (pronounced suh-no-tay) you are about to learn about one of the most magical experiences in all of Mexico. Tulum is surrounded by cenotes, which are naturally formed cave pools with beautifully clean blue water. Most of them have places to jump in, swing from a rope, or climb down a big ladder to enter. The best cenotes are the smaller remote ones, hidden in the middle of the jungle. We’ve been to several different ones now, so I can provide you an accurate description of each. The Grand Cenote is the biggest, most popular one near Tulum. There is an area that has swimming turtles, plus bats will be flying around in the caves. (They don’t bother you, though. Don’t worry!) They have snorkel equipment you can rent, but I recommend bringing your own! Also, we wore our water shoes and I was SO glad we brought them! It gets super busy here, with lots of kids running around, so get there early before the rush! Floating around in the crystal clear water of the Grande Cenote. The Temple of Doom is a smaller, less popular cenote that we discovered on our way to The Grand Cenote. It has three different places you can jump in, along with a giant ladder to climb back out. There were hardly any people here, which made it a little bit of a better experience. 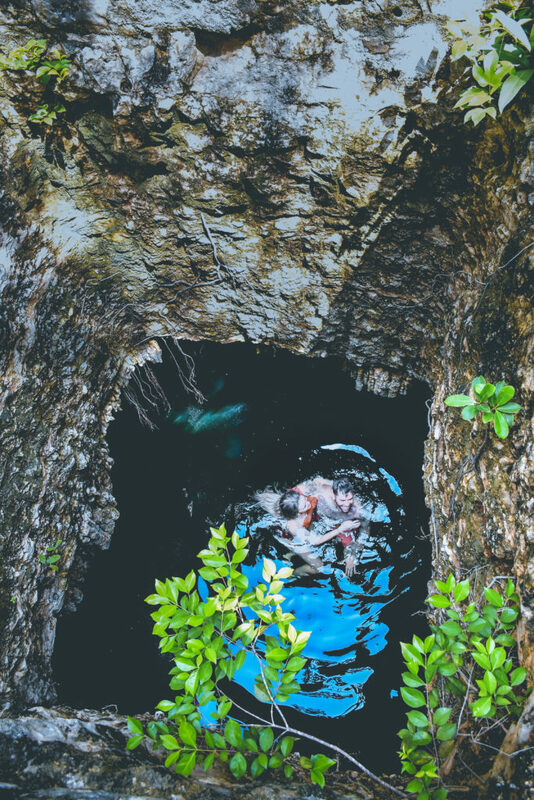 It’s hidden way back in the jungle and definitely worth a visit, especially if you’re on the way to the Grand Cenote anyways! Looking down into one of the cenotes on the Tankah property. We had this place to ourselves! This water was pretty dang cold! We also got to swim in this cenote with no other people around! Tankah is seriously magical. 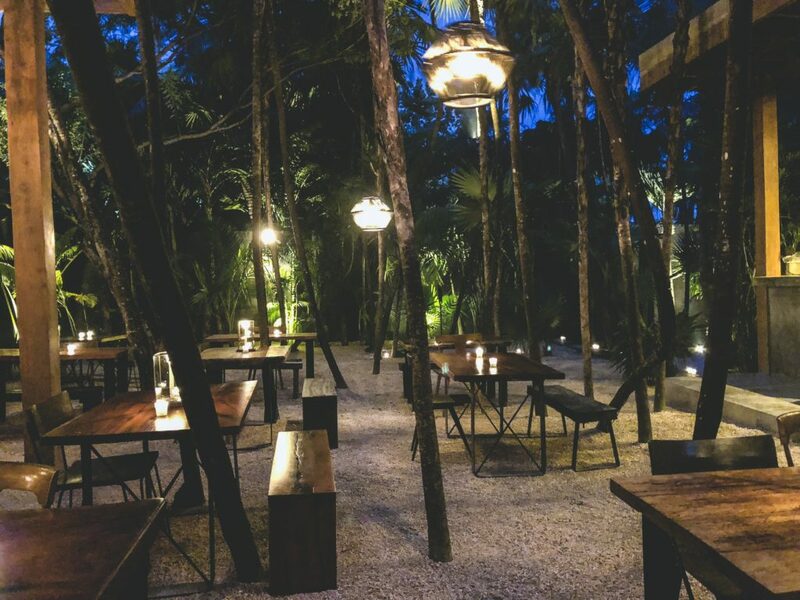 There’s literally only one unfortunate thing about Tulum and no one talks about it! The recent seaweed dilemma. When we visited in July, the beaches were covered in seaweed and the water wasn’t a pretty blue color because of it. We had no idea this was an issue, so we were super bummed when we got there. Supposedly it happens more in the warmer months and then clears up when it gets a little bit cooler. There were still areas with some seaweed on our most recent trip, but it was sooo much better in October than when we were there in July. After it stormed one night, we woke up to seaweed all over the beach, but then after the workers cleared it away, it pretty much stayed away for the remainder of the trip. The high season is December-February and supposedly the beaches are back to beautiful and seaweed-free by then. (I kept watching the Tulum geotag Instagram story before we went to see what the beaches looked like in random people’s videos! That’s honestly the best way to check the seaweed status.) The seaweed doesn’t keep us from wanting to return to Tulum, but if you’re visiting in the warmer months, you shouldn’t expect perfectly clear turquoise water. Just a heads up! This was the seaweed on the beach the day after it stormed overnight. Most places in Tulum only accept cash. 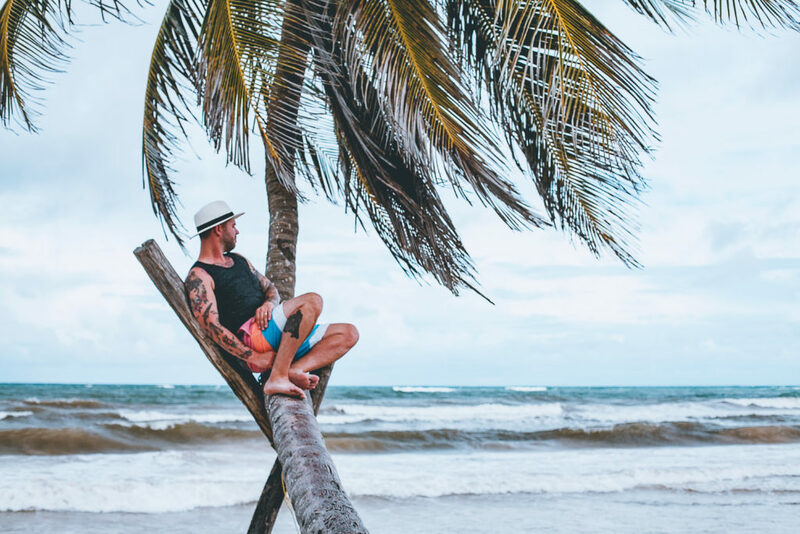 Many do take American, but there are a handful of places that are pesos only. You can find ATM machines all over the place, but we exchanged our money in the airport before we left so we didn’t have to worry about it. Some of the restaurants will take credit cards, but not very many and if they do they usually charge you a processing fee. Make sure you get dinner reservations ahead of time! The only place we were dying to eat but didn’t get a chance to (they close during the off season) is Hartwood. I’ve heard it’s incredible! 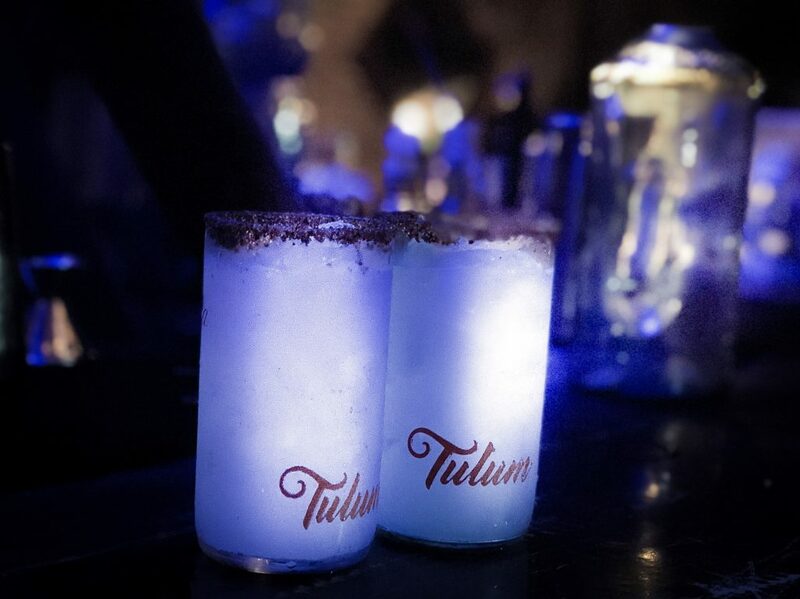 If you have any questions about anything Tulum related, please don’t hesitate to reach out! 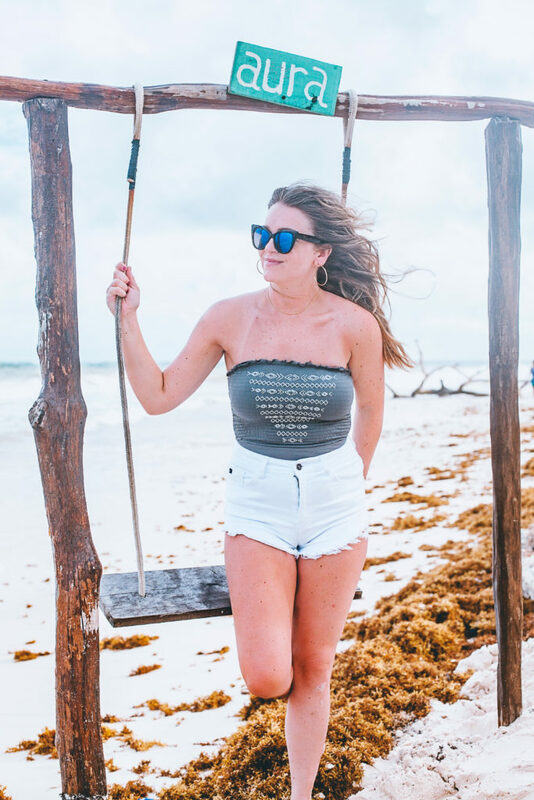 And if you’ve been to Tulum and I missed something important, please share in the comments below! Don’t forget to follow along on all of our adventures via my Instagram. Special thanks to my real life AND Instagram husband Jordan Heid for always documenting our travels so well!